This little girl is pretty in pink as as she delightfully gazes into the camera. 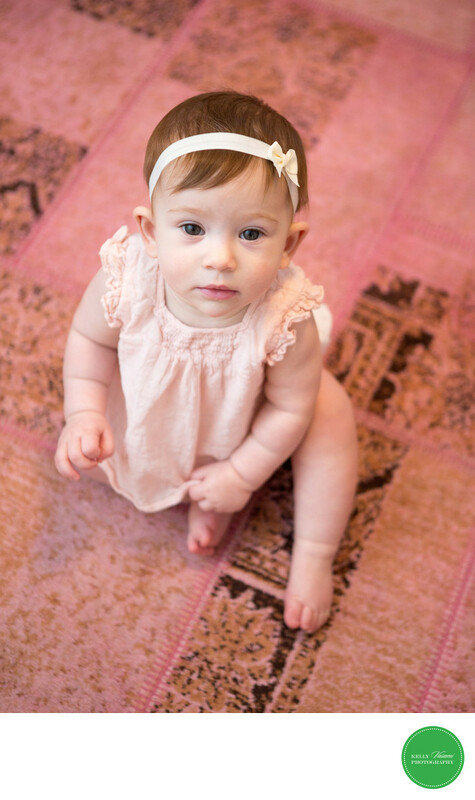 Adorn in a soft pink dress and an understated pink bow headband, this image highlights the miniature size of this sweet babe's young age. The ariel angle is also a great tool to encourage looking directly at the camera. The pink rug adds interest and contrast without overpowering the image. The soft little rolls on her arms mark this particularly "squishy" stage of her life. Lastly, her soft sweet lips are an understated exclamation point to the natural sweetness of this photograph.